Growing: Â Easy to moderate This hybrid mostly sativa marijuana strain is the result of crossing Northern Lights #5 and Skunk#1. Â The result is a strong cannabis plant that has excellent champion genetics with the capability to adapt to almost any growing environment whether indoor and outdoor. Â This strain can also be grown by beginners who have a basic understanding of marijuana cultivation.Flowering time for FOG marijuana plants can be expected once it reaches 80 days from the time it enters vegetation stage. Â It grows tall due to its mostly sativa genetics and will grow buds that will turn to a deep purple colour when it matures. 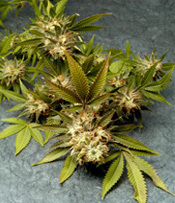 Â The wait is well worth it as this strain has the capacity to produce high yield and buds that are rich in THC content. Â The smoke it gives is intense and full-bodied with an effect that is highly cerebral and good for medical marijuana users. I have been smoking FOG because it is the strain recommended to me by my doctor.Â Yes, I can smoke it legally and it is really good for my migraine.